He serves as narrator of the water puppet performance. In the beginning, he raises the festival flag from the water without it making a splash. The unique feat is always a curious thing for audiences. The show officially begins and wows spectators. Water puppetry is a special treat for tourists in Ha Noi - a must-see show for all foreign visitors. While Indonesia has shadow puppets, Japan has bunraku theatre with black-clad ninja puppeteers and in the US, people know Kermit the Frog, Miss Piggy and all the other members of the madcap Muppet gang, Vietnam has an 800-year-old art form called traditional water puppetry, remarked Things Asian Press. Thang Long Water Puppet Theatre, located on Dinh Tien Hoang Street near Hoan Kiem Lake, is the most popular theatre for water puppetry. In addition, there is Lotus Theatre on Hang Trong Street, the Central Water Puppet Theatre on Truong Chinh Street and several private venues. The water puppet performances are various and touch on everyday life activities of Vietnamese people, entertainment and plays that set examples of national heroes, and traditional opera plays like cheo and tuong. 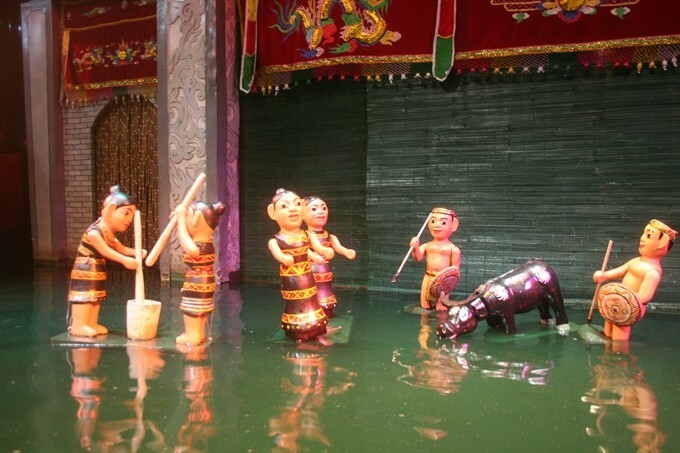 Water puppetry has its origins since the 11th century in the Red River Delta of northern Vietnam where the wet-rice civilisation took shape, according to Chu Luong, vice director of the Thang Long Theatre. Water puppet theatre is called thuy dinh, set up in communal ponds. The performance is often organised on the occasion of the local festival which gathers all of the villagers, especially children. A water puppetry show is accompanied by musical instruments such as drum, two-stringed fiddle, flute, drum kit, 16-chord zither or monochord. In the water puppet play, artists use firecrackers and fireworks to create a special effect and attraction. Puppeteers carve their puppets from fig tree and waterproof them with resin from the lacquer tree. Puppets range in height from 30 to 100cm. The puppets are covered with red lacquer trimmed with gold. After the 45-minute-long show, many tourists buy the little puppets as souvenirs. "During performances, puppeteers control their puppets through a stick-and-string apparatus concealed by the pond water. This apparatus extends behind the stage curtain to the hidden puppeteers who stand in waist-deep water," researcher Nguyen Huy Hong wrote in his book Vietnamese Traditional Water Puppetry. Currently, tourists are offered performances of puppets controlled by poles. Audiences learn the trick at the end of the show when artists come out from behind the rattan curtain. During the show, they just see the puppets on the water surface acting out various scenarios, including the dragon dance, unicorn fighting for a ball, farming and fishing. A piece like fighting fox catching duck is exciting enough to gain claps from audience. A couple of peasants appear when they are raising ducks peacefully. Suddenly, a mischievous fox appears and catches their ducks. “This act is one of the most special techniques in water puppet show,” Luong explained. The fox swims to catch a duck and then he hides behind the bush, climbs up a tree, until he catches the duck and carries up to the tree. The interesting act provokes and attracts any audience. Thang Long Theatre holds the Asian record for “the only theatre in Asia that performs water puppetry all 365 days of the year”. “The playhouse has 300 seats, and we serve about 1,700 shows each year,” said Luong. The theatre offers three to six shows a day, depending on whether it’s the low or high season. Bob Iskandar from Jakarta visited Ha Noi recently on a business trip. For him, Vietnamese water puppetry is something wonderful and beautiful. He said he had never seen such a thing in any other place in the world. What impressed him the most is the puppets, which are colourful and have eye-catching movements on the water, he said. “I may comment about it with one word, ‘bravo’, I really enjoyed it,” said Iskandar. Despite the language barrier, audiences can still easily follow the storyline of the pieces. “I understand that it’s about people’s ordinary lives, and that people should co-operate and help each other, avoid violence and work together towards harmony,” Iskandar said. Iskandar suggested that managers make the voices louder and provide audiences with ear phones and an English interpreter meeting international standards. Additionally, for international viewers, it would be helpful to provide them with leaflets before performances so they can read about the show, he added. “There is a leaflet at the gate, but it just provides names of the pieces, and foreign tourists need more information,” he said. Dang Bich Tho, vice director of Ha Noi Red Tour Company, said each month the company brought about 50 groups of tourists to water puppet performances. “Thang Long Theatre is located in the centre of the capital,” she said. “From the theatre, tourists can visit the Old Quarter, do sightseeing around Hoan Kiem Lake and discover simultaneously famous cultural historical relics such as Ngoc Son Temple, Ha Noi Opera House and the Museum of History. As an experienced tour operator, Tho visited many water puppet theatres in Ha Noi to find the ideal location for visitors. She also recommended the private theatre of artist Thanh Liem on Kham Thien Street. In addition to enjoying the show, tourists have the chance to speak with artists and learn about the water puppet art. “So, for tourists who have more time and are really keen on water puppet, we often bring them to Liem’s theatre,” said Tho. She also arranges tours to the outskirts of Ha Noi, where traditional water puppetry troupes like Dao Thuc and Hong Phong are based. “In addition to watching puppet shows, tourists have more time to discover the art, talk with the locals and enjoy the food with them,” said Tho. “These tours bring unforgettable memories for foreign tourists. Tho said all the theatres should upgrade their service quality to satisfy tourists. Each year, the performance’s content should be changed because there are many tourists who want to watch more shows when they return to Viet Nam. "And they don’t want to try the same foods, either," she said. “In the high season, the tourists who come to watch puppetry are many in number,” said Tho. Thang Long Theatre Vice Director Chu Luong said many private theatres opened recently to offer tourists more options for water puppet shows. “Cultural managers and artists should work harder to improve the quality of the performance, preventing the risk that shows with a low quality could leave a bad impression on tourists,” he said. Luong pointed out the fact that he and other veteran directors have created some new pieces to bring audience a new perspective on Vietnamese traditional water puppetry. The new creations such as Legend of the Fairy and Dragon have been introduced at international puppetry festivals and won prizes. The piece is about the legendary origin of Vietnamese people. Father Lac Long Quan who was originately a dragon, met fairy Au Co (an immortal mountain fairy who married Lạc Long Quân). Their love gave birth to 100 siblings, who became ancestors of 54 ethnic groups. Some of them live in the delta, others in the mountain, yet, they all share the same blood. However, after the festivals, they are forgotten. Luong said in the future, he and the directorial board will try to introduce new pieces alternately with the traditional water puppetry.